I am making good progress on “Spell Checked”, only 2 more chapters to write! I hope to have some of the first few chapters edited by next week that way I can post chapter 1. I still haven’t decided on a book cover or written the blurb for the back, I guess I am procrastinating doing this because it means that this book is ready to stretch its wings and fly….or come crashing into the ground. 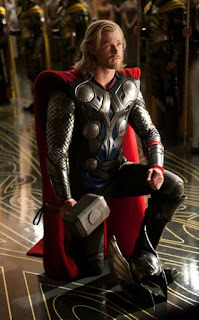 Okay, I know this is Thor, but I could not resist his HOTNESS! Lily had always taken life seriously, even as a kid she spent her time learning to sew and cook while the other children played games. And now at the age of twenty-four she looked back with much regret, for what man would want a woman who knows nothing of fun? It goes without saying; she would make a good wife having honed those skills to perfection since childhood. Her husband would certainly be well fed, have clean pressed clothes and a tidy house…that is if she had one. But for all her preparations to become the perfect wife, she miscalculated one thing- men liked to have fun and enjoy the company of their female companions above all else. This was something she had no skill for, as she never laughed, never smiled, never teased…even playful banter was lost on her. It was not long before the rumors started to fly. Any man that had met her was left scratching their head, the irony of such a beautiful woman being so dull, left them befuddled and soon it was said that she had been cursed for something she had done in her past, which left Lily even more melancholy than before. One day as Lily walked home from the millers with a bag of flour in tote, she ran into a man in the forest. He was tall and handsome, his blond shoulder length hair was tied back with a strip of leather and his eyes sparkled like the waters of the ocean as he leaned against a large oak smiling. Lily had never seen a man as handsome as this one and even his odd attire, dressed as if from a time when men walked around carrying swords, did not distract from his beauty. “You look like you could use some help carrying that heavy bag of flour,” he said. “As you wish,” he replied bowing and gesturing for her to pass. Unbeknownst to her, he had made a hole in the flour bag as she passed. Lily thought for a second, why should she not accept the kindness of such a handsome man. So, she stopped, turned around on heals and tossed him the bag, which tore completely open at the spot where he had made the hole, covering him in the entire contents. Lily paused for a second then laughed so hard, tears welled up in her eyes. That was the moment Loki knew he had found his wife…for anyone with a laugh as beautiful as hers deserved to have a trickster for a husband. Is Loki's wife just a short or part of something else? I liked it a lot. I've always loved Pan. Just a short for now, but with me you never know...My other short "Zander and Jovie" is my next project, the book will be called "Departure". I am also considering a book of shorts, once I have written enough of them.